utility vehicle from Walt Bennett of Empire Tractor. With Dan are his wife Nancy and grandson Zach. Seneca Falls, NY – Empire Farm Days has announced the winners of competitions and drawings at the 2013 farm show held at Rodman Lott & Son Farms in Seneca Falls, NY. 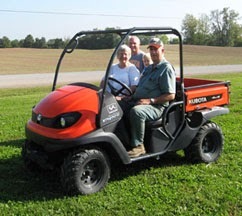 Lyons, NY, dairyman Dan Wolf won the Kubota RTV 400 sponsored by Kubota and Empire Farm Days. “We go to Empire Farm Days see what’s new, talk to specific product dealers, and see people we do not cross paths with anywhere else,” Wolf adds. “It was a great surprise to win the four-wheeler. It will get used a lot in varied ways because it is so convenient to jump on and go. It is a fair distance between the dairy complex and the shop, so the RTV is already saving us a lot of jogging back and forth,” Wolf says. Dairy farmer Brad Almeter of Strykersville in western New York won the Savage 10 Trophy Hunter XP bolt action, accutrigger rifle with a Nikon 39x40 BDC scope sponsored by Beikirch’s Ammunition of Rochester. Joanne Schoonmaker of Manlius, Onondaga County, NY, won the Empire Farm Days Equine Center saddle sponsored by Empire Farm Days. The top three winners of the 2013 New York State FFA Welding Contest, sponsored by Haun Welding, Briggs and Stratton Yard Power Products Group, Clinton Tractor and Implement, and the Calidonna Family, at Empire Farm Days received Morrisville State College scholarships. Dakota Pingrey of Pioneer Central School, Yorkshire, NY, earned top individual honors, followed by Perry Lewis of Penn Yan Central School and Hewitt Meeder of Sherman Central School. Meeder and Gabe Rater of Sherman Central School earned the High Team Performance honors. The New York State Tractor Driving Safety Contest, sponsored by John Deere, Kubota, H&S Farm Equipment, New Holland Case International, the New York Center for Agricultural Medicine and Health, Massey Ferguson, Java Farm Supply, Mabie Brothers, and the NYS FFA Leadership Training Foundation at the 2013 Empire Farm Days welcomed students from across the state. The winner of the Junior Division for 14-16-year-olds was Hadley Palmerton of Pioneer Central School. Dakota Pingrey of Pioneer Central School won the Senior Division for 16-18-year-olds. Michael Murphy of Wayland, NY, received the 2013 Empire State Potato Growers Association Scholarship at the 2013 Empire Farm Days Ag Leadership Luncheon. The scholarship provides $500 per academic year for up to four consecutive years of agricultural education. Murphy has begun studying agricultural science with a business minor at Cornell University. Sheland Dairy Farms, owned and operated by the Donald, Doug, and Todd Shelmidine of Jefferson County, was presented the NYS Agricultural Environmental Management Award, co-sponsored by the Empire State Potato Growers, New York State Department of Agriculture and Markets, and American Agriculturist magazine at the 2013 Empire Farm Days Leadership Luncheon. Planning for the August 5-7, 2014 Empire Farm Days is already underway. For more details, contact Empire Farm Days Manager Melanie Wickham, 877-697-7837, mwickham@empirefarmdays.com. 0 Comments to "Lyons Farmer Wins Empire Farm Days Prize"